Jeremy Burleson is a 25-year-old autistic man who speaks very little. When he does talk, it's mostly about Scotch tape. Calling it "white art plastic," Burleson uses the tape in conjunction with good, stiff paper to create oversized syringes, foldable hospital beds, those bright standing lamps necessary for surgery, and the medicine vials, long needles, stethoscopes and crutches of the emergency room. In short, Burleson uses tape and paper to create art. A client at Richmond's NIAD Art Center, Burleson is one of 10 so-called outsider artists whose work is currently on show at the Sonoma Valley Museum of Art. Titled "Outsider Art: The Creative Necessity," the exhibit brings together NIAD clients with short biographical sketches and a rich handful of their work. In Burleson's case, a small room has been erected against the museum's wall to allow visitors to step inside his installation of a hospital room, an alcove guarded by an oversized mobile the young man has solely strung with tape-and-paper syringes that move slowly in the room's air-conditioned gloom. Both slightly creepy and emphatically beautiful, Burleson's work is singular, obsessive, inward and uniquely personal. He spent much time in the hospital as a boy. His ability to deftly sculpt medical objects from homely materials is powerful. Like NIAD's other clients, this artist is also so profoundly disabled that he is, in the words of the center's executive director Pat Coleman, "unemployable in the mainstream business world." Outsider art, an elastic term that mostly applies to art created by those who are developmentally disabled, is enjoying its second contiguous decade of vogue. Initially popularized in the first half of the 20th century as "art brut" ("raw art") by French artist Jean Dubuffet--who primarily admired the art of patients in insane asylums as well as that of young children--"outsider" art became the preferred English term in the 1970s and the preferred American must-see exhibit of the 1990s. 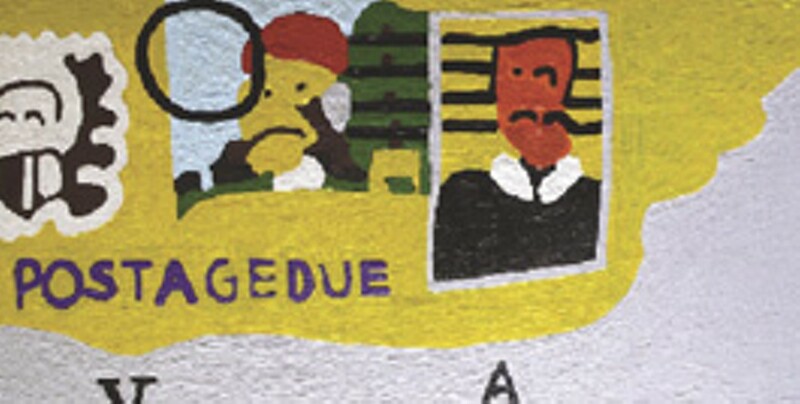 Outsider art is generally characterized by a free use of color, such reiterated ideas as devotion to a single object's form, childlike lettering and--as with Jeremy Burleson or NIAD client Willie Harris, who paints the same house-as-face portrait every day--an extremely personal vision. Nondevelopmentally disabled viewers often appreciate the freshness of the art, its lack of calculation and pretense, its presentation wholly uninformed by art training, art-world aspirations or art history itself. And indeed, wandering "The Creative Necessity" show at the SVMA, one is continuously struck by the caliber of the work. Or, rather, one is continuously calibrating the value of the work, a trickier proposition. Willie Harris' Untitled (Red & Green) could be a proud and highly priced addition to any gallery's wall; Beverly "Bubba" Trieber's found-object assemblage panel Eisenhower finds a rhythm in material and texture that could make Rauschenberg weep. But if the 85-year-old Trieber is unaware of such as Rauschenberg and the gallery world itself, is it fair to view his work in such a context? If not, how does a viewer shed his or her own sense of context and appreciate the work in a solely formal manner, giving no thought beyond color, surface, form and integration? Michael Schwager, professor of art history and museum studies at Sonoma State University and the curator of Napa's di Rosa Preserve, appreciates the conundrum, comparing the work of developmentally disabled artists to those crafts created to honor the earth's magic. "When you look at Native American artifacts, we see them as isolated," Schwager says by phone from his university office. "They are often ceremonial artifacts. They're meant to be used and kept private when they're not used. [With outsider artists,] we're seeing this private expression, the 10,000 lines on the head of a pin, and we're judging it on the traditional aesthetics that a [trained] artist would use in sitting down and working out a strategy. I don't think that these artists work in this same way, but it's hard not to judge them within that construct." To that end, Schwager notes that many museums and other collecting institutions that showcase outsider artists don't allow the work to travel separately. "Outsider art is a topic when people are moving from one construct to another," he explains. "You take it from one room to another, and suddenly the artists become art-world stars and don't even know it. The artist wants you to see what he sees in his head, and you're riffing on how incredibly Paul Klee-like it is. Outside of context, the work shouldn't make sense, because then we're voyeurs, looking at the work for our own devices." There's a certain shudder associated with that, as though admiring and enjoying an artist's work isn't a good enough goal on its own. One must be able to separate formal concerns from emotional knowledge. Schwager assures that not everything in this world is that hard. "If people are working towards a goal of making art and they find an audience, that's a good thing," he says. "All artists reach into their private life and put it down for other people to see. The fact that they put it down on canvas, on paper or make an object means that they want us to see it. "Perhaps we're completing the circle by doing that." 'Outsider Art: The Creative Necessity' continues at the Sonoma Valley Museum of Art through Oct. 22. Gallery hours are Thursday-Sunday, 11am to 5pm. 551 Broadway, Sonoma. 707.939.SVMA. Becoming Independent's 'The Bug Show' exhibits at the Quicksilver Mine Co. Sept. 23 through Oct. 29 and opens with a public reception on Saturday, Sept. 23, from 4pm to 6pm. Gallery hours are Thursday-Monday, 11am to 6pm. 6671 Front St., Forestville. 707.887.0799.